Are they green olives or black olives? Do your trees make table olives or oil olives? How long before I get fruit? How do I process the fruit? How much fruit can one tree bear? Can they be grown in cold climates? Is it true that olive trees need to be kept dry? Can olive trees be grown in South Florida? That's a matter of ripeness. All olives left on the tree will eventually ripen to black. Olives can be pickled at any stage of ripeness. "Green ripe olives" are picked at a certain stage of development, when the juice inside turns from clear to milky. Olives to be used for oil are usually left on the tree until at least some color change has occurred. "Black ripe olives" can be ripened on the tree or picked green and turned black in processing, as with "California Black Ripe Olives." See the link below at the question "How do I process the fruit?" 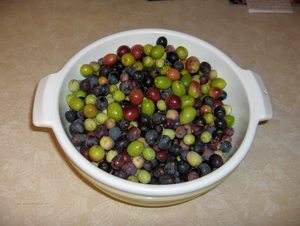 for recipes for home processing of olives. Wherever olives are grown, almost any cultivar of olive is used for both table fruit and oil. References to a particular cultivar's purpose is generalized and refers to the primary commercial purpose of the cultivar. The exception to the rule is a few cultivars that produce very little oil and so are generally used only as table fruit. A large percentage of the Egyptian cultivars fall into this category. That is a function of cultivar. 'Arbequina' and 'Koroneiki' begin fruiting at an early age (about 3 years). Other cultivars do not make fruit until they are five to twelve years old. Most olive cultivars will not produce fruit without a pollinator tree of a different cultivar. There are also non-fruiting cultivars of olive. Olives grown from seed may never produce fruit and, if they do, will not likely have the same characteristics as the parent tree. Olives are ripe enough for green pickling when the juice inside is cloudy instead of clear. Semi-dwarf varieties typically bear around 30 or 40 pounds of fruit per year at maturity. Larger cultivars such as 'Mission' can bear up to 100 pounds of fruit in a season, and the giant 'Chemlali' can produce nearly a ton of fruit in one year. Some people do grow olives in places where winters are very cold but they take extreme measures to protect their trees from low temperatures. Those who attempt to grow olives in pots to be brought indoors in winter often fail. Olive trees are very demanding of light and potted trees must be up-potted at least once each year or else treated as a large bonsai tree. Absolutely not. Olive tree culture is much the same as for any tree. Though drought resistant after they are thoroughly established, olive trees need a lightly moist but not soggy soil. Under-watered trees will not grow to their potential and may not fruit. Florida's porous sand does not hold water and olive trees can stress quickly during drought conditions. Olive trees grown in containers will need frequent attention to avoid overly dry soil conditions. Yes, they can grow well there but are unlikely to fruit because the weather is too warm for olives to achieve the dormancy required for flower development.